Market Timing Brief for the SP500 Index Close on 9-20-2013: Testing, Testing. QE Reduction Coming Soon! The SP500 Index is back testing the last breakout after reaching the top of the longer term up channel last week at 1729.44, just below my target of 1730 mentioned in last week’s video (see Market Timing Show™ post). 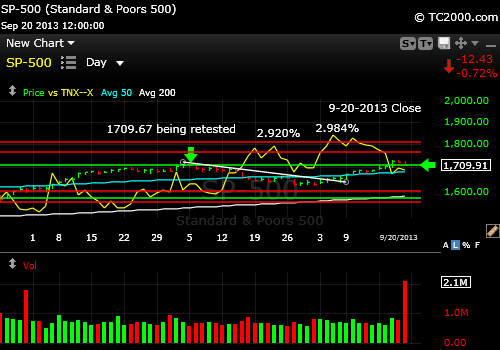 I thought the upper line forming the long term channel would hold the SPX (SPY) and it did. Investors reacted very positively on an initial basis to the Fed announcement that it would forgo the reduction of QE that the market had predicted for September’s meeting in the range of 10-20 billion. Wall St. was dead wrong. What I knew beforehand was what I Tweeted – that the market would react very positively, that is stocks and metals, if the Fed did less than a 10 Billion dollar reduction of QE. It did zero and metals and stocks initially flew! Then Bullard of the St. Louis Fed blabs that they might actually taper in October, which has caused the retest of the prior breakout and the metals to sell off sharply. Some transparency! We must now hold above the last breakout for the SP500, or we will likely slide back into a more significant correction. I’ve already begun trimming a bit by selling my natural gas position on Friday. I may trim again on Monday. Follow my twitter comments to follow this discussion in the most timely way. Unless you are willing to rebuy lower, selling probably does not make sense, although you may have to watch a 5-10% correction occur. I suspect that the market will do OK on a longer term basis as long if the Fed moves slowly to reduce QE AND the economy continues to improve. Eventually we’ll be left with JUST THE ECONOMY to justify Price: Earnings ratios on stocks. If the E drops due to sluggish consumption and sluggish economic growth, the PE will have to come down via selling in the stock market to lower prices. The moment the stock market feels that the Fed is doing TOO MUCH QE reduction, it will sell off. The fact that Bullard immediately corrected the bounce in the metals and stock markets after the Fed meeting by saying that they could move as soon as October to reduce Quantitative Easing likely means that the Fed is very close to reducing QE. Because of the fear surrounding QE reduction, we should see somewhat lower prices in the near term followed by another rally to higher highs if the slow economic recovery continues and retail performs well into the fall. There are tangible signs of recovery, but the momentum must continue. SP500 Index back testing last breakout. Rates should not disturb stocks too much as long as they stay in the range of perhaps 2.46% and 3.00%. The lid in the chart above is just below 3%. My feeling is that stocks may sell off a bit if rates exceed 3% in the near term. Only if economic growth is higher, will higher rates make sense to the markets. 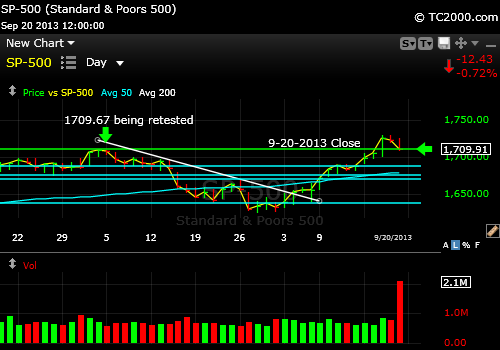 You see in the chart that the SP500 Index was able to rally despite a rise in rates. If the stock markets correct further following a break of the prior high, rates will probably drop some more toward that 2.46% level. Bonds may not benefit as much as they did in the past, as investors are now being brainwashed to avoid bonds, so there will be a build up of cash which will rush back into stocks as soon as there is a sense that the Fed is not going to mess things up that badly after all. My opinion is that investors should be selling bonds into the coming mini bond rally and buying stocks back at lower levels for the next rally. I’ll rebuy stocks lower with the cash I raised on Friday and more that I may raise early next week. Note that this cycle of selling will INCREASE the amount of money going into stocks on the next move up as money moves from bonds to cash and back into stocks. See the GLD gold ETF post as well, which will be published soon. This entry was posted in Bonds, federal reserve, investment, large cap stocks, S&P 500 Index, Treasuries and tagged 10 year treasury, market timing, sp500 index, spx, spy, tnx. Bookmark the permalink.